The wedding is a dream two people in love want to last a lifetime. The memories of this most important event in our lives are cherished forever. So, it is natural for the newly married couple to share the precious moments of their wedding with friends and close people. 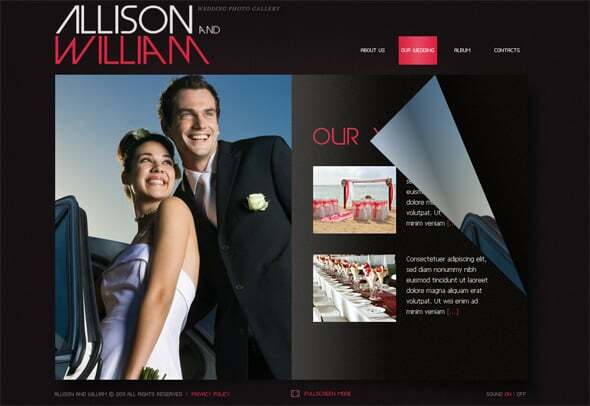 A great idea is to create a wedding website with a rich gallery of photos, some interesting wedding details, and so on. Years later, your beautiful online wedding album will revive the emotions you both experienced on the most special day of your life. 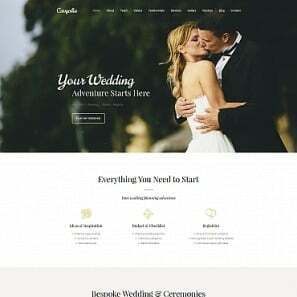 Getting started with your own wedding website is really easy. 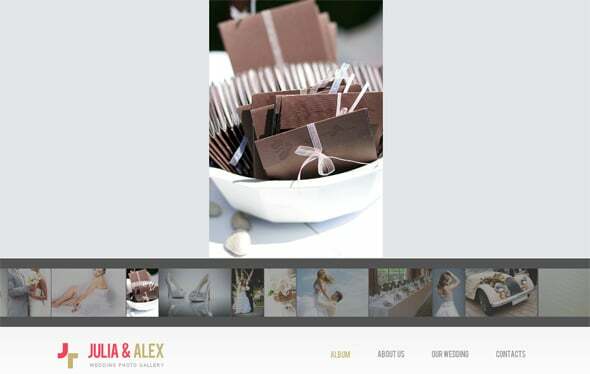 You don’t need to be a programmer to create a professional, stylish and extremely beautiful wedding album. 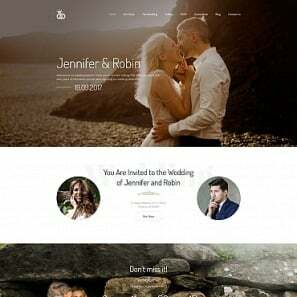 Today’s post showcases the newest responsive wedding website templates that were specially developed by MotoCMS team for wedding albums and the portfolios of wedding photographers. 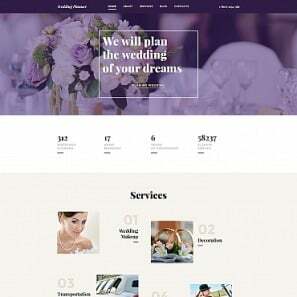 Each of the wedding website templates to make a wedding website of your dream is a complete website with the integrated Moto CMS. 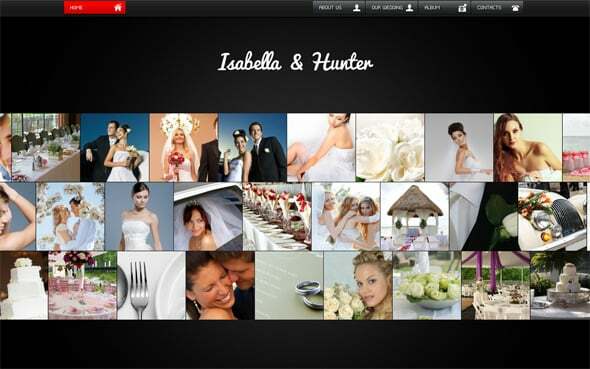 You will be able to create a wedding album in a blink, without anyone’s assistance. It couldn’t be any easier to create a highly functional interactive wedding album with this striking Flash photo template with transitional effects. Catchy and extremely stylish, it will become a brilliant solution for any wedding album or a wedding photographer’s portfolio. Your website visitors can easily browse through the website section due to the intuitive menu that can be modified via the “Main Menu” module within the control panel. You can add as many sub-pages of the menu sections as you wish. The photo gallery that is navigated intuitively will showcase your wedding photos in a special way, and definitely amaze your album’s visitors. To scroll the gallery, just hover the mouse over the left or right gallery’s side. Point the cursor over a photo, and the gallery will stop. When you click on an image preview, the full-size photo will open. You can easily add a description to each photo which can be visible below the photo when a visitor hovers the mouse over the image. The photos can also be viewed with the arrow buttons below the image description. This attractive wedding album with an impressive layout and stunning visual effects will definitely become an excellent solution for your Special Day website. Black-and-white layout, transitional effects and great textures used in the template’s design make the solution really stunning. 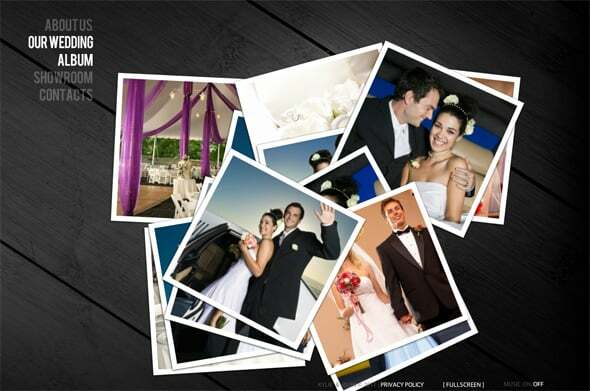 The photo gallery will present your wedding photos in a creative way: the images are thrown on a dark background what creates a great visual impression on visitors. Click any image to zoom in and see the photo of the original size. One of the most attractive features of the portfolio is the “Showroom” section where the visitors can view the photos one by one and read the description to each of the works. This section will especially be useful for wedding photographers who showcase their works for sale. 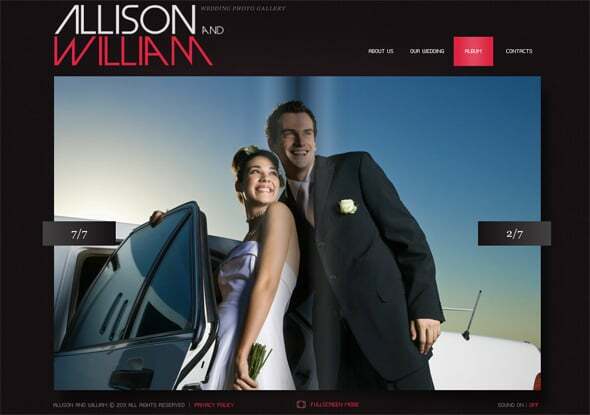 A clean style design works the best for wedding photo albums. 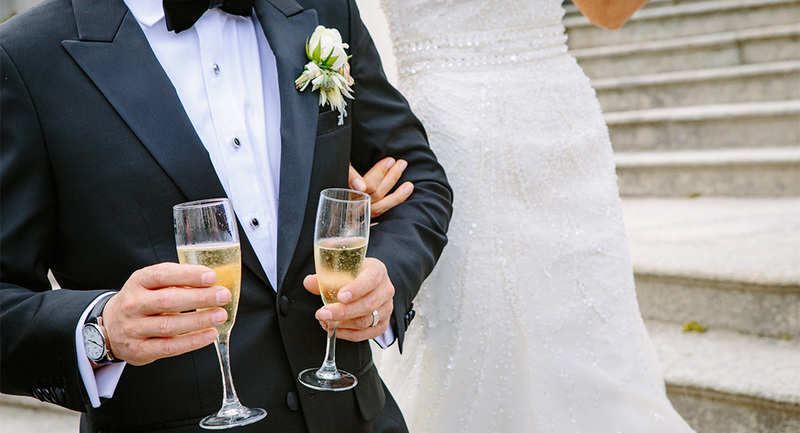 Touching wedding photos look amazing within the frame of tender cleanness. Free from clutter and heavy design elements, this minimalistic portfolio looks stylish and professional. The gallery is performed as a slideshow that can be disabled if necessary. The photos can be viewed by using the hidden arrow buttons placed on the right and left of the image. 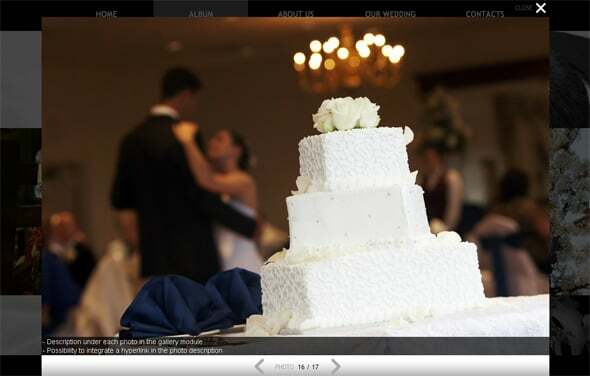 The “Our Wedding” section can showcase the info regarding the wedding ceremony. 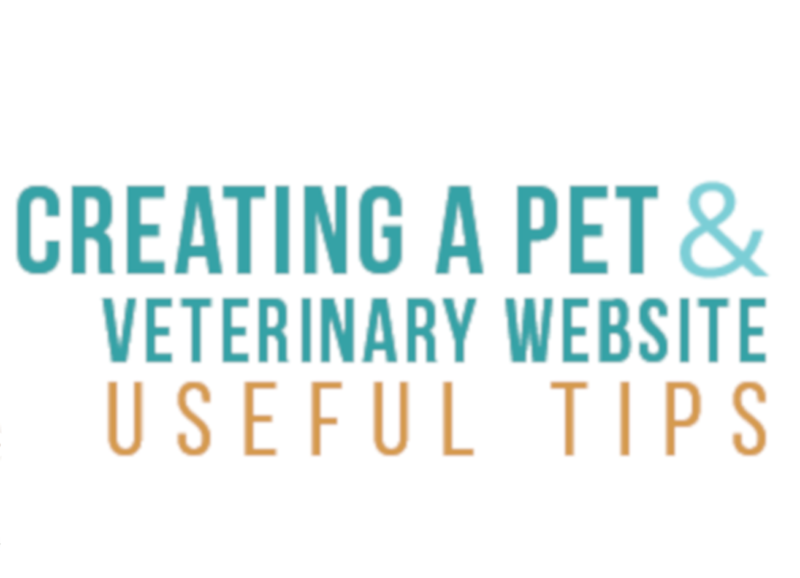 You can even embed videos in the website and add a description to each of them. If you are searching for some really impressive solution for your photography portfolio, this Flash template with the integrated WYSIWYG editor will be a great choice. The clean layout makes the portfolio unobtrusive but extremely stylish. The website sections of the website can be filled with your own content and modified to your liking. This neat Flash book will showcase your wedding photos in the most creative way. 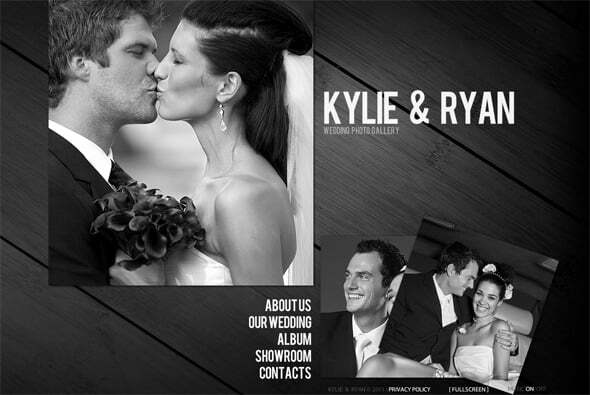 Your wedding album can be performed in the form of a digital book that looks like a glossy magazine. It’s indeed an unusual and memorable solution for a wedding album. The photo gallery is navigated with the numbered buttons or by clicking on the page’s corner. The transitional effect makes the photo album more impressive and adds more charm to the portfolio. 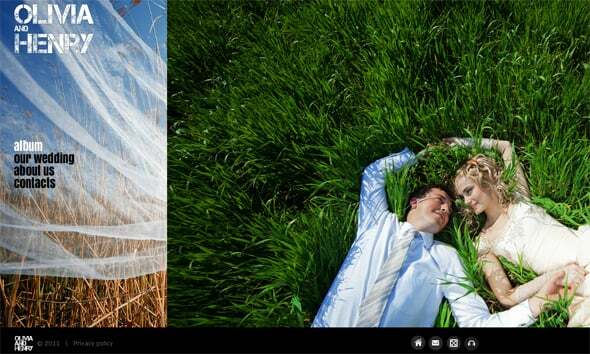 This attractive wedding Flash website is peculiar for the amazing gallery previews that easily run when you point the mouse over them. 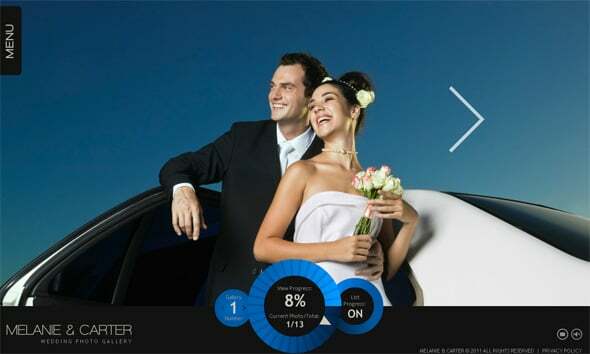 Bright interactive elements on a dark background create an unforgettable impression on visitors. The full-size photos can be viewed by clicking on the thumbnails. Also, your website visitors can view the photos by clicking on the arrow buttons. Moreover, there is an ability to add a description to each photo. 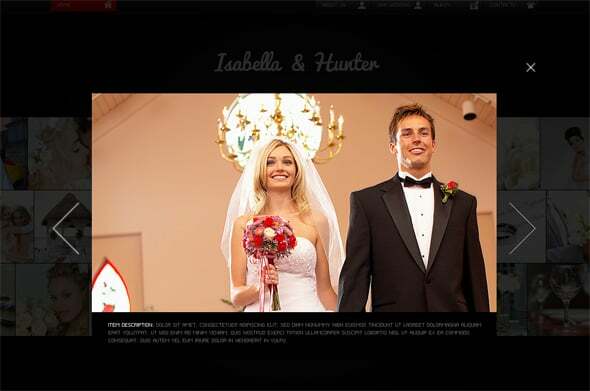 This wonderful clean Flash template may become a great basis for your online wedding album. The thumbnail preview strip is easily running when you hover the mouse over it. Click on the photo preview you would like to look at, and a full-size photo will open. 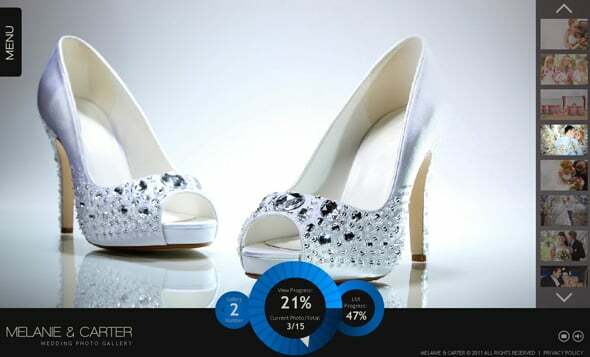 The functionality of this stunning template allows you to upload the photos of any size, what makes this wedding solution universal. You are not limited to the number of images, so you may add as many photos to the album as you wish. This neat stylish design may become a fantastic choice for a wedding album or a wedding photographer’s portfolio. The unusual image gallery with vertical scrolling and intuitive navigation allows the visitors to view the photos in a simple convenient way. The full-size preview is performed in slideshow mode, but it can be easily disabled by clicking on the “stop” button in the center of the photo. In addition, the photos can be viewed one by one with the arrow buttons. 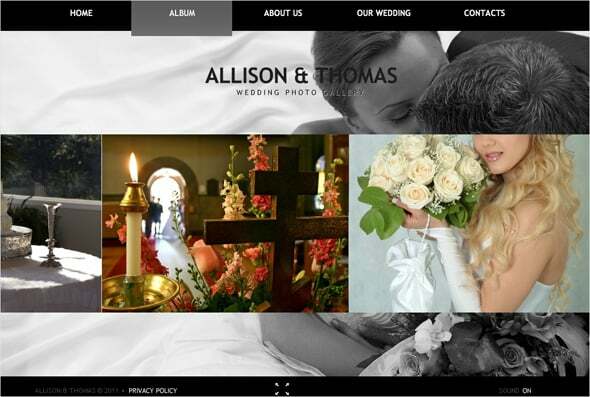 This wedding gallery creates a fullscreen gallery of your precious photos and gives the viewers a chance to examine every single detail of your works. 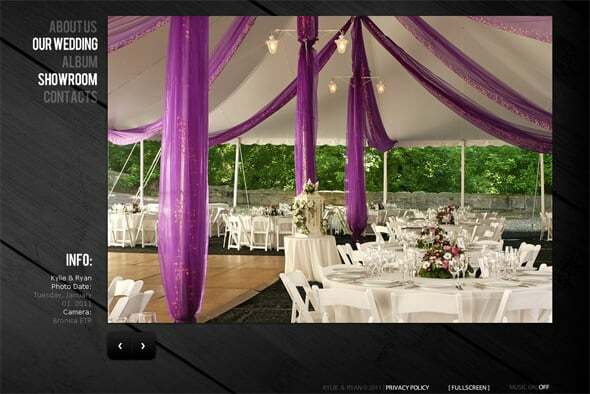 A simple yet stylish menu will help your website visitors to easily navigate the album. One of the most impressive details of the album is the gallery navigation: to open the next photo, you should click on the current one. Due to the richest media library integrated into the template, you can add as many photos as you need. This photo portfolio with a simple concept is a great way to showcase your wedding photos and make a really cool wedding album. The gallery works in full-screen mode what makes the template really interesting. The navigation is performed in an unusual manner: the photos are displayed in full-screen mode, and to view the next one you just need to click on the current photo. This gorgeous gallery is definitely one of the most stylish, original and highly functional solutions in the niche. There is a progress indicator that shows the number of the gallery you are looking through, the number of the current photo as well as the thumbnail gallery progress. A pretty interesting design solution. The thumbnail preview is navigated with the arrow buttons. You can choose the photo you like in full size by clicking on its thumbnail. 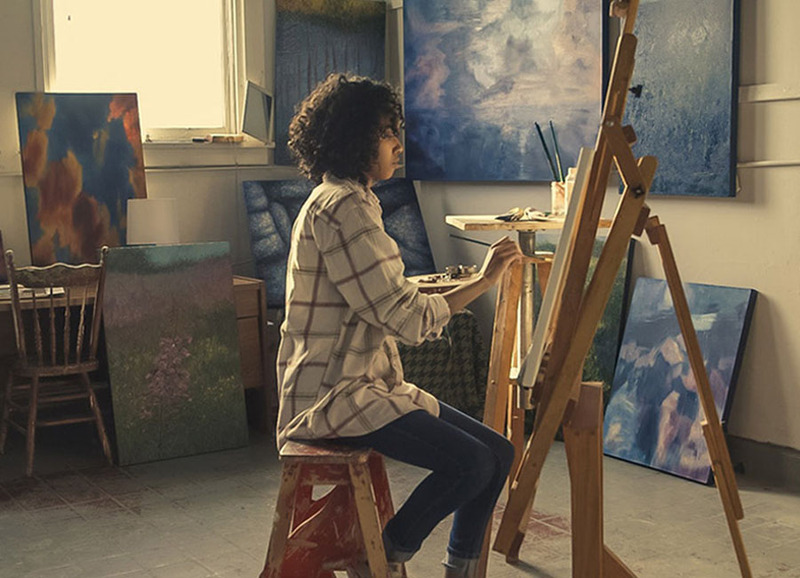 The full-size gallery is navigated by clicking on the current photo. 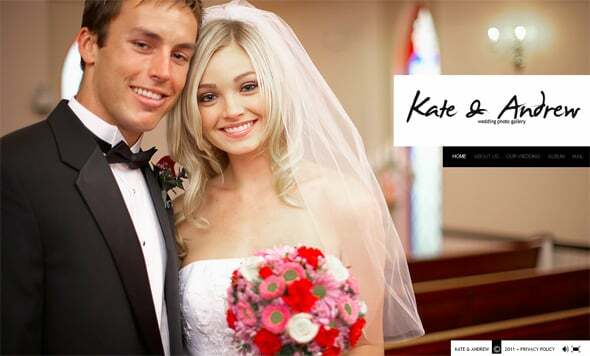 Remember that you have an opportunity to test all wedding website templates by registering the 14 day Demo. 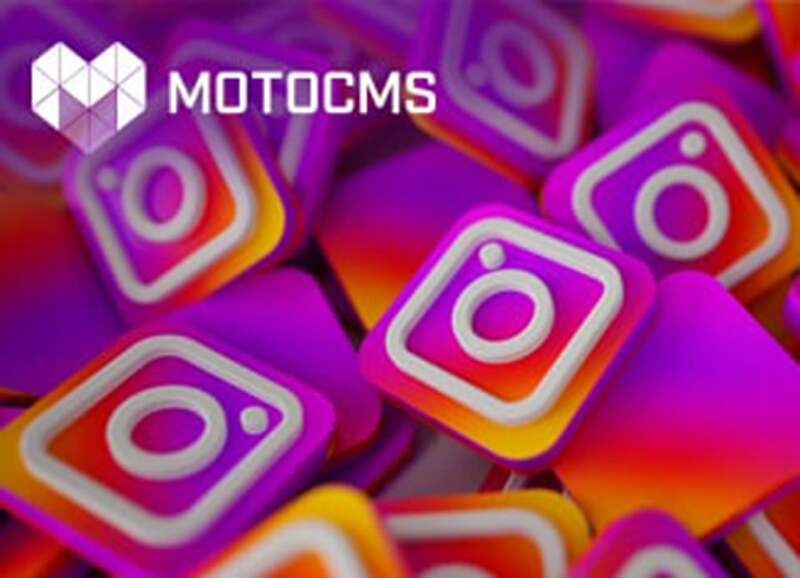 The Demo version is 100% corresponds to the licensed product and allows the users to customize the template and use the system to the full extent. 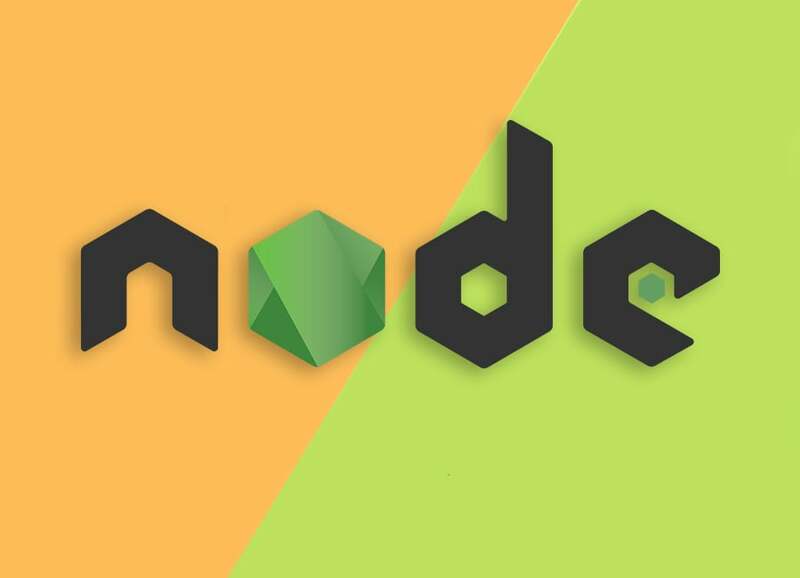 Moreover, you can always change the current template to another one using the same e-mail. After 30 days, you will be able to buy out the customized template with all the modifications made within the control panel.